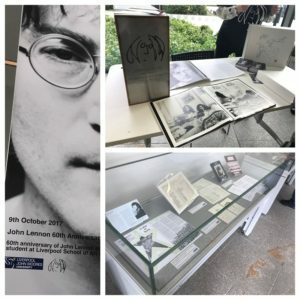 The legendary John Lennon had his birthday honoured with a unique celebration of his life, career and links with Liverpool John Moores University. This week in 1957, John enrolled at the Liverpool School of Art, starting his incredible journey to the very top within the world of music and the arts. October 9th marks what would have been the Beatles hero’s 77th birthday, and today’s commemoration had a highly appropriate setting at LJMU’s John Lennon Art and Design Building on Brownlow Hill. LJMU put on the exhibition showcasing his earliest talents, such as his old submitted coursework and assignments, which are kept safe in the university archives. Along with his art and old submissions, a time capsule with personal tributes and solo works was on display, giving fans and onlookers a peak into how he changed and inspired so many people’s lives. Childhood friends, Bill Harry and Rod Murray, were taking part in talks about what one of Liverpool’s most famous sons was like as a student growing up in the city. LJMU staff got involved with a Lennon lookalike photo booth, complete with Beatles clothes and wigs, with visitors getting pictures of themselves dressed up as one of the famous Fab Four, and receiving a free t-shirt. John’s wife and long-time artistic collaborator, Yoko Ono, sent a personal message, which said: “I salute the new and returning students of the Liverpool School of Art and Design; you are lucky to study in such a stimulating international city; I am always inspired by the many different languages I hear when I visit Liverpool and I am hugely supportive of students who are pursuing their dream. “Creative expression and art is an innate part of the human experience and having the chance to study your subject in detail and find your path through academic endeavour is a truly unique opportunity. “Sixty years ago, John was given this opportunity; he enrolled at the Liverpool College of Art and it provided the catalyst for so many important steps in his later life.